diabetic dal recipes. Indian diabetic kadhi recipes. 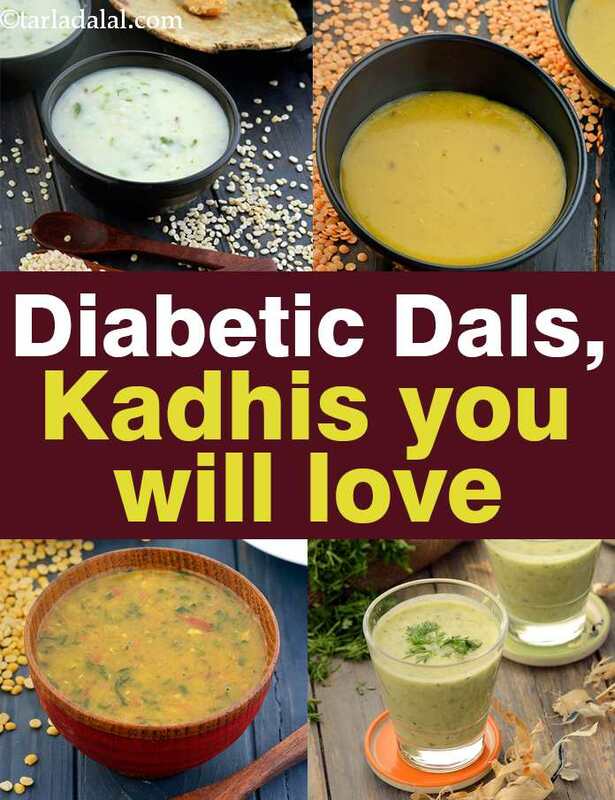 A handy collection of some delicious diabetic friendly dals and kadhis, which are prepared using healthy cooking methods and ingredients to suit the needs of diabetics. You will discover inside this section, a spectrum of recipes from different cuisines that will add spice and variety to a routine diet. These dals and kadhis are just what you need to square off a healthy meal that keeps blood sugar levels in check. Toor dal (arhar dal) is an excellent source of complex carbohydrates which is the major form of energy. When you eat food it is broken down into glucose which is used by our body for energy. So include toor dal in your meals through methi toovar dal recipe , palak toovar dal recipe, gujarati toovar dal recipe and dahiwala toovar dal. Urad Dal or Split Black Gram are high in Fibre, low glycemic index of 43 and suitable for diabetics. So include khatta urad dal reicpe made with low fat curds and zero oil. Try protein rich basic urad dal recipe. There is the gujarati style urad dal recipe. Moong dal is rich in Folate, Vitamin B9 , high in fibre and perfect for diabetics. Try the tangy moong dal recipe, chana toovar green moong dal recipe, rajashtani dal recipe , moong dal sultani recipe. Palak is diabetic friendly and goes well to make palak kadhi recipe. Karela is a diabetic super food and try it with karela kadhi recipe. Tomatoes are low in calorie and use it in tomato kadhi recipe. What to have with Diabetic Dals and Kadhis? Combine the diabetic friendly dal recipes with a bajra roti, jowar roti and whole wheat roti to make a healthy combination. Note that when you combine any dal with any cereal ( bajra, jowar, ragi, whole wheat ) then the protein quality is enhanced. Enjoy our collection of diabetic dals, diabetic kadhis and Indian Diabetes recipe articles below.